I was told that this chain has its roots in this traditional dessert spot in Sheung Wan that I frequent. I remember the many frustrating trips to this place, craving for the desserts but only to find it closed as it didn’t have fixed opening hours and the senior waiters with an attitude. It has since gone contemporary with multiple branches throughout Hong Kong to boot. 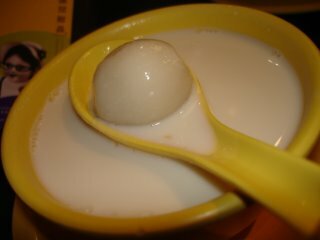 Best known for its steamed egg custard dishes, my preference here is usually for their smooth almond cream with sesame filled dumplings (below) and the rich walnut soup. Terribly heavy, the walnut that is, but totally absolutely divine!